Biography of Norwich School Watercolour Landscape Painter. Landscape artist, John Sell Cotman was one of the most important figures in the development of 19th century English watercolour painting. Born in Norwich he was - along with John Crome (1768-1821) - one of the prominent leaders of the Norwich School of painters, a group of East Anglian landscape artists who were influenced by 17th century Dutch Realists. Little is known of his beginnings in art, but he did spend time in London, and toured Wales and Yorkshire making sketches and watercolours. He returned to Norwich in 1806. His style was highly original; his landscape painting employs clearly defined areas of colour structured by abstract patterns and shapes. 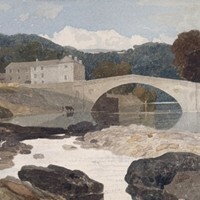 His most famous landscape paintings were those he made on his trip to Yorkshire between 1803 and 1805, such as Chirk Aqueduct (1804, Victoria & Albert Museum, London); and Greta Bridge (1805, British Museum, London). He also painted several marine paintings, such as The Mouth of the Yare (Sphinx Fine Art, London). Between 1810-21 he published etchings of the antiquities of Normandy and Norfolk which were warmly received. He was survived by his sons John Joseph Cotman (c.1812-78) and Miles Edmund Cotman (1811-58) - both painters who also became members of the Norwich School. Cotman was born in Norwich in 1782 to a merchant family. Little is recorded about his early life, except that he showed a youthful talent for sketching. His father intended his son to join the family business, but Cotman was more intent on becoming an artist. In 1798 he moved to London, and was first employed by the owner of the Depository of Arts, in the Strand. He associated with local artists, and in 1800 he was introduced to the art collector Sir George Beaumont. He also came under the patronage of Dr Thomas Monro whose house was a meeting place for esteemed artists of the day, including the great Romantic JMW Turner (1775-1851), the acclaimed watercolourist Thomas Girtin (1775-1802) and the landscape painter Peter de Wint (1784-1849). Cotman joined a sketching club run by Girtin, and went on group drawing expeditions to Surrey and Wales. In 1800, at the age of 18 he had his first painting accepted by the Royal Academy of Arts in London, and was awarded an honorary palette by the Society of Arts. He continued to exhibit at the Academy until 1806, after which he returned to settle in Norwich. On Cotmans return to Norwich, he soon married and settled to a life of teaching and painting. The Norwich School comprised the members of the Norwich Society of Artists, a club founded in 1803 by John Crome (1768-1821) and Robert Ladbrooke (1770-1842), where landscape artists came together to discuss art. They were primarily influenced by Dutch 17th century artists Meindert Hobbema (1638-1709), Jacob van Ruisdael (1628-82), and Jan Wynants (c.1625-84), as well as Turner. The Norwich landscape and coastline was their main subject matter, which they represented using the new method of plein air painting. Their style marked a departure from the Rococo prettiness of Thomas Gainsborough (172788) and the Arcadian classical landscape favoured by Claude Lorrain (1602-82). Members of the School included: James Stark (1794-1859), George Vincent (1796-1831), Joseph Stannard (1797-1830), Alfred Stannard (1806-89), John Thirtle (1777-1839), and Thomas Lound (1802-61). Cotman became involved with the Norwich School in 1807, and became President following Crome's death in 1821. The School continued to thrive until he left Norwich in 1834, and remains an important part of English landscape painting. Indeed, for a group of working class artists, largely self-taught, who were only concerned with painting the local landscape, they achieved great art. They might have achieved greater exposure and thus fame, were it not for the fact that local art collector JJ Colman (of Colman Mustard) bought many of their works. These works, out of sight of the main cultural centre London, remain on permanent display at Norwich Castle Museum since the 1880s. In Cotman's early works, the broad washes of his watercolours anticipate French Impressionism. One particularly famous composition is Chirk Aqueduct (1804, Victoria & Albert Museum, London); another is a watercolour entitled Greta Bridge, sketched during the summer of 1805. The picture is built up of distinct patches of restrained colours, held together with a precise pattern of line and geometry, almost anticipating Paul Cezanne (1839-1906). See also the painting techniques of the short-lived Richard Parkes Bonington, a pioneer of the plein-air painting tradition. Cotman's mature style became richer and more colourful than his earlier work - more like Victorian paintings, which are less appealing to modern tastes. Between 1812 and 1823 he spent periods of time on the coast of Yarmouth, and produced a number of marine paintings, including The Mouth of the Yare. This harmonious composition draws the viewer's eye to a group of brightly dressed fishermen, rowing their boat with a larger ship in the background. In addition to painting and drawing, Cotman made several etchings of antiquities and old buildings and published his works in several volumes. In 1834 he was appointed Professor of Drawing at King's College School in London, partly on the recommendation of his friend Turner. One of his pupils was Dante Gabriel Rossetti (1828-82), who later became a key figure in the Pre-Raphaelite Brotherhood. Cotman died in 1842 and was survived by his two sons Miles Edmund Cotman and John Joseph Cotman. His work can be found in some of the best art museums, including the British Museum and the Tate in London, the Yale Center for British Art in New Haven, Connecticut, and the Castle Museum and Art Gallery in Norwich.  For a chronology of important events, see: Timeline: History of Art.